I first met Bertrand Gourdou some years ago during a tasting in Paris. I was immediately seduced by his wines that had the depth of the south with a well balanced fruit. Bertrand is an energetic young producer that can claim over 10 years of experience in wine making. He is the 6th generation producing wine on the property. 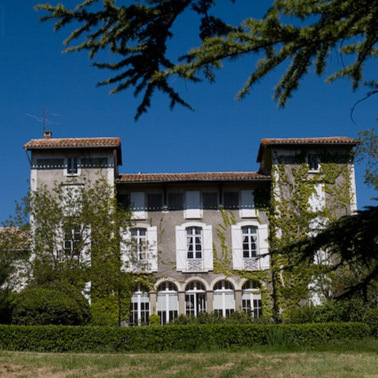 Chateau Guilhem is today the leading estate in the Malpere appellation, an AOC (Appellation d’Origine Controllee) his grandfather helped to create by being the first in 1970 to plant Bordeaux grapes in this typical grenache, carignan and syrah country. In 2007 Malpere became a standalone appellation based solely on merlot, cabernet franc and cabernet sauvignon grapes. The 92 acre estate produces mainly red wine and went bio in 2013. The grapes are harvested and fermented per field, giving Bertrand great material to assemble his various cuvees. Cement tanks and barrels are used to age the wine in order to keep the freshness and the structure of the wine. Chateau Guilhem has undergone major transformations in the last 5 years and today is one of the up and coming stars in the area. 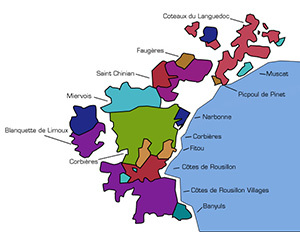 The five best known appellations in the Languedoc region include Languedoc, Corbières, Faugères, Minervois and Saint Chinian. The appellation system in the region is undergoing considerable changes with both new appellations being created and existing ones changing. In 2007 the Coteaux du Languedoc has changed name to Languedoc and been extended to include the Roussillon. The famous Pic St Loup cru is currently under the Languedoc appelation.